Castro reportedly told an interviewer he would be willing to meet with Obama. (CNN) - The Obama transition team declined comment Wednesday on a report that Cuban President Raul Castro might be interested in meeting with the president-elect at Guantanamo Bay, and had told an interviewer Cubans could "send [Obama] home with the American flag that waves over" the U.S. base there. Asked whether he would be willing to visit Washington to speak with Obama, Castro instead suggested to actor Sean Penn Guantanamo Bay could serve as "neutral ground" for discussions. Castro also told Penn, in an interview published in The Nation, that the two leaders "must meet and begin to solve our problems." 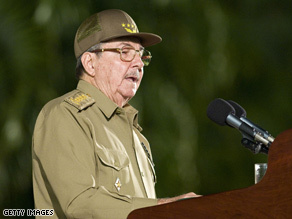 Raul Castro’s brother, longtime Cuban leader Fidel Castro, criticized Obama this spring for his position in favor of altering – but retaining – Washington’s nearly five-decade trade embargo on the island nation. Obama came under fire from campaign rivals for his statement at a CNN/YouTube Democratic primary debate that he would be willing to meet without preconditions with Castro and other leaders hostile toward the United States. As the old proverb says "Like readily consorts with like." This is a new day with an intelligent President who has impressed the world with his common sense approach to diplomacy before atracking. This would be a wonderful opportunity to reach out to Cuba and see what common ground we have. I know there are many Cuban families who have been separated for generations because of the former Castro regime. Nothing but goodness can come from talking and creating understanding between nations. Obama has the ability to heal our relationships and forge new ones with world leaders. The more allies we have, the more we can isolate the terrorists and make the world safer for everyone. I don't think that Cuba fares that bad when compared to Capitalist and Free people in the Carribeans like Jamaica and Haiti. So, communists are the devil and God anointed Capitalists? Let's keep bailing out the wonderful capitalists at AIG, GM and those Wall Street CEOs who had multi-million dollar golden parachutes for running this economy into the ground. Time to drop the commie boogeyman fears and realize we have become more frightening to the world than any other nation. Our fallen soilders, are returned home with a flag. I do not see Castro`s remarks , about returning with the flag as a friendly invite. Stay home Obama and clean up the Repugs huge mess., before our country starts to look like Cuba.. It's futile to try and have an intelligent conversation with McCain-ites, their problems are beyond solutions! Let's continue to keep them in our prayers, and maybe by this time next year they will have joined the rest of us! Happy Thanksgiving to you, too, "Anonymous" Coward." What the heck - YOU represent America, too. Whatever works!! God know not MUCH does right now !!!!!!!!!!! Isn't it amazing being a Canadian . . . Isn't it amazing, darlin'– that being Canadian YOU have absolutely NO say in our government? Surprise, surprise ! Now, that said, stop coming to the U.S. for TRULY quality health care !!!!!!!! I'm not an American; But as I see it, hostile leaders are hopeing obama is weak ...like carter...and who cares if America has no friends around the world....hah....like the U.N. could do anything....look...the rest of the world just wants your money....and help...and....on and on..... And your press is so one sided ...even after Bush was elected....they seem to have problems....like a ship with a bad lean.